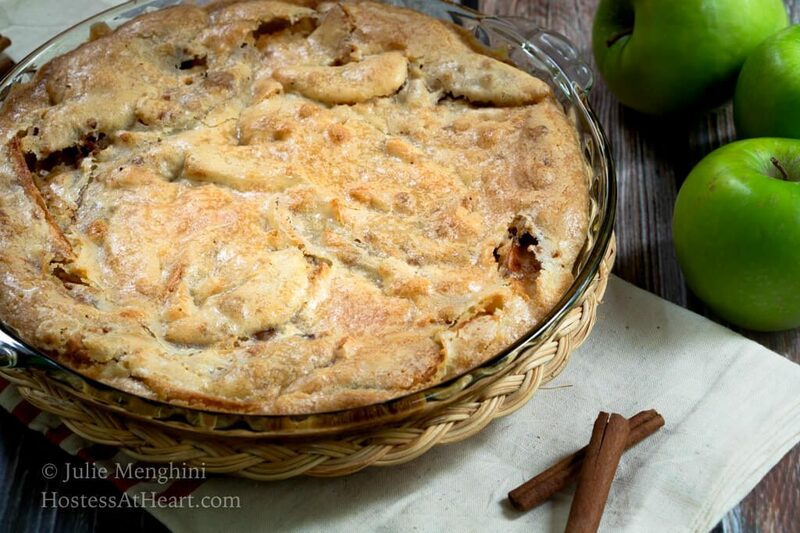 You are here: Home / Cooking / Recipes / Swedish Apple Pie – The Easiest Pie You’ll Ever Make! 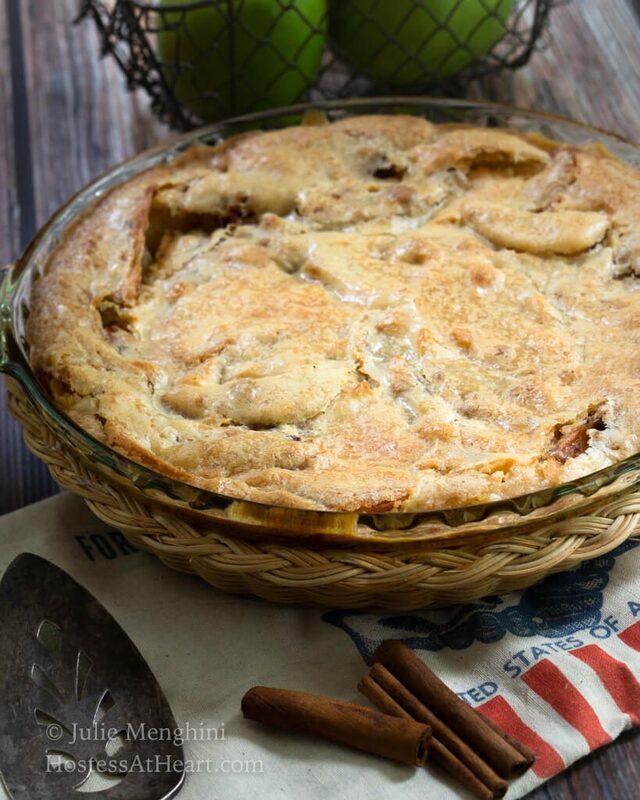 Swedish Apple Pie – The Easiest Pie You’ll Ever Make! 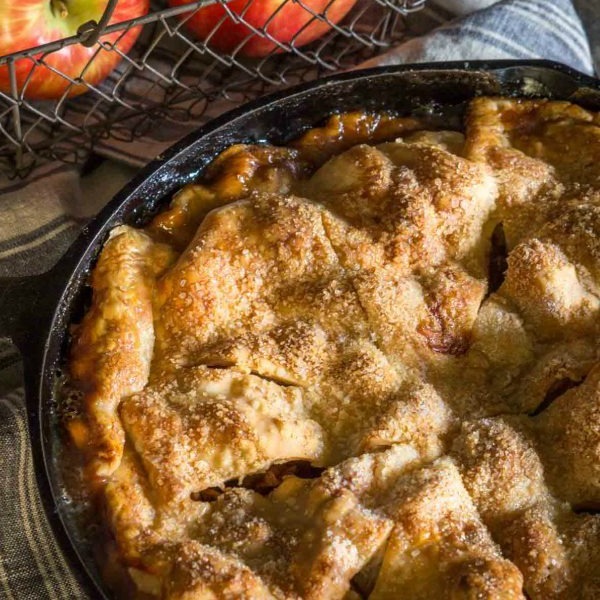 This Swedish Apple Pie recipe is just as easy to make as it is delicious to eat. It’s the perfect no-fuss pie for an easy dessert or for the beginner baker! 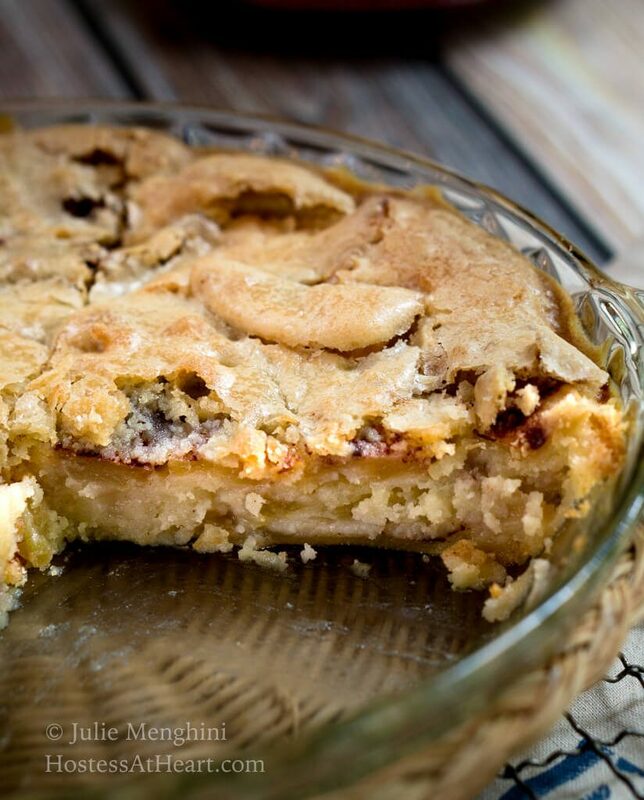 This Swedish Apple Pie recipe is one of those recipes that you are going to make over and over. 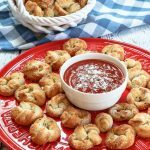 It is so easy to put together because you don’t have to make or mess with a crust! That makes it easy for anyone to put together. 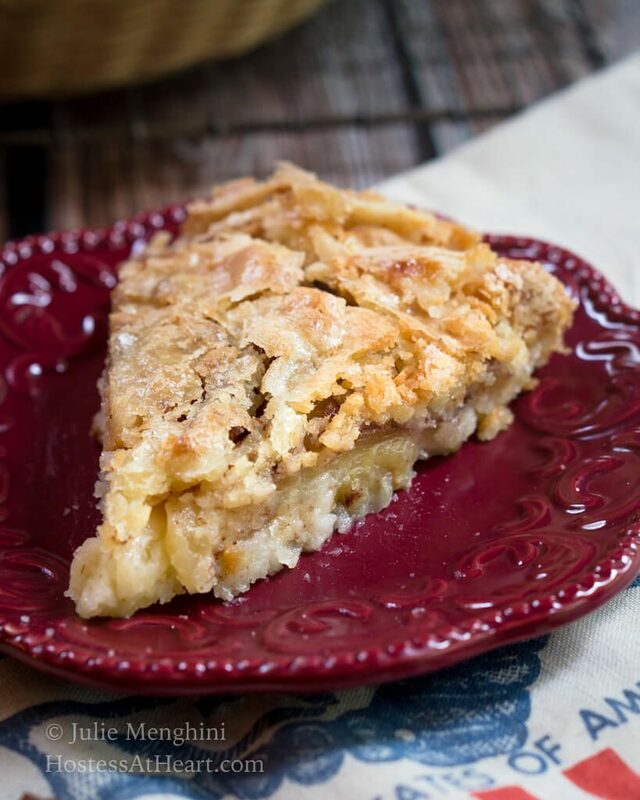 I’ve been wanting to bring this Swedish apple pie recipe to you for a long time! I don’t know how Swedish it is but it’s a recipe that my mother made and one of the very first pie recipes that I made. When I recently made this pie John said that I hadn’t made this one for a long time. He’s right. It’s one of the pies that I made on a regular basis when we were first married. I have a bad habit of trying new recipes and neglecting our tried and true ones. As much as I like to bake, there were a few things that I really resisted trying. Pie crust was one of them and I didn’t mind using a store-bought crust. That is until I learned to make my own! Yep, homemade pie crust is better and explained in my Pineapple Cream Meringue Tart recipe. You don’t have to worry about any of that pie with this recipe. 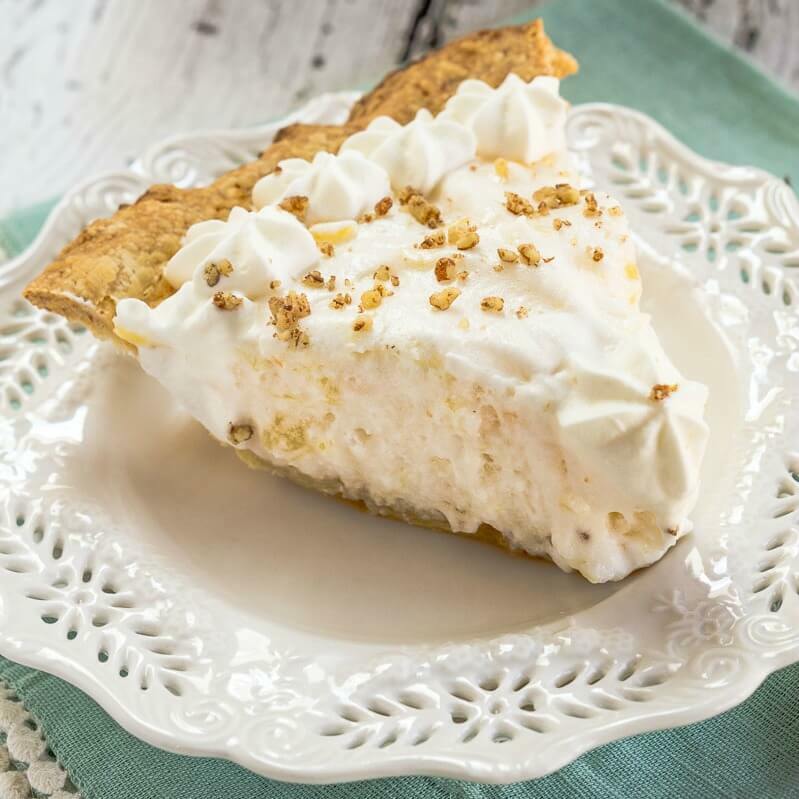 The batter that you pour over the top seeps into the pie and leaves a lightly crunchy crust that is a delight to bite into. 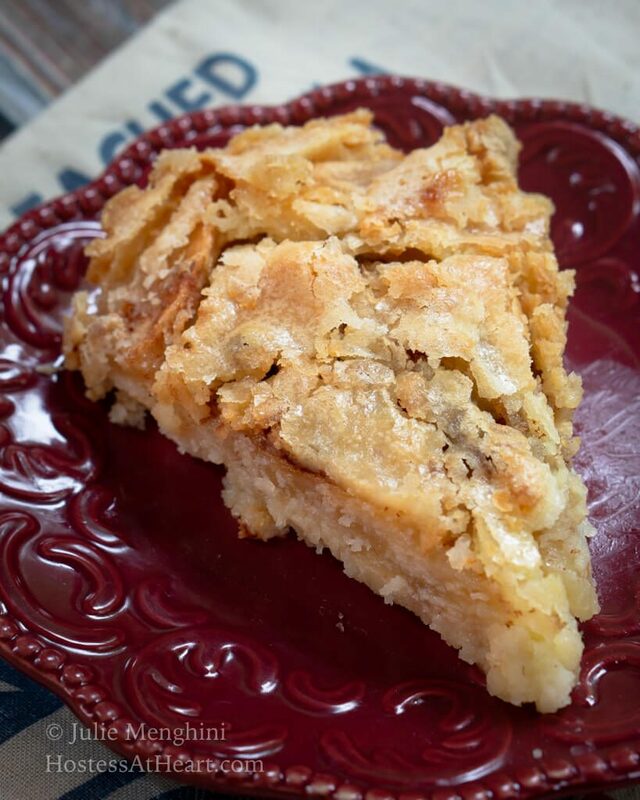 Swedish Apple Pie - The easiest pie you'll ever make! This Swedish Apple Pie is just as easy to make as it is delicious to eat. It's the perfect no-fuss pie for an easy dessert or for the beginner baker! Peel, core, and slice apples 1/4" thick. Fill pie plate 2/3 full. Sprinkle with 1 tablespoon of sugar and 1 teaspoon of ground cinnamon. Combine topping ingredients and spread over the apples. Bake for 1 hour or until crust lightly browns. Cover leftovers with aluminum foil and refrigerate. Allow melted butter to cool slightly before mixing it with the other topping ingredients so you don't scramble the egg. 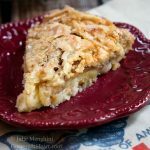 If you want an easy and delicious pie and don’t want to mess with a crust you’re going to love this pie. It looks different every time I make it based on how the apples settle. It’s never failed to be delicious though. This recipe is also a great pie to make if you are a beginner baker. There are just a few simple steps and wahla, you have a pie! If you’ve been following me for a while you know that I am a pie over cake person. 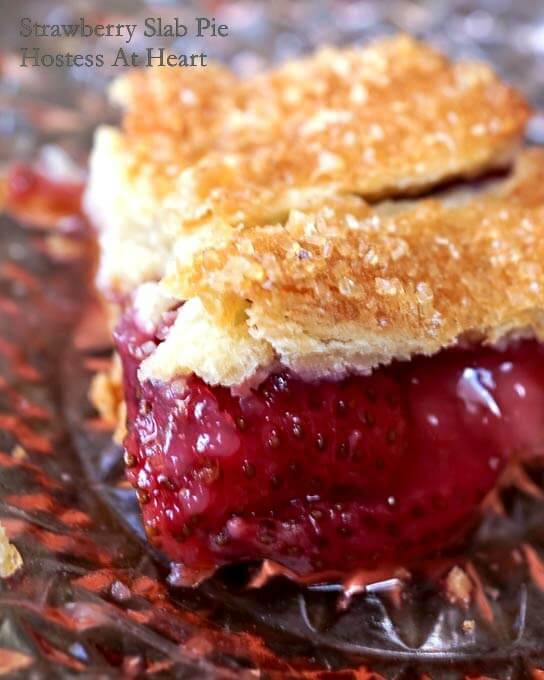 And even though I’d never turn down a yummy cake, here are a few pie recipes that we love! Delicious! As promised, very easy to make! Only thing I did differently was adding about half teaspoon of cardamom into the topping ingredient. Yum! Thank you, Shelly! Adding cardamon is definitely a great variation! Thanks for letting me know and commenting so we can all see this variation too. Isn’t it funny how some of our favorite recipes get forget over the years as we decide to try something new. 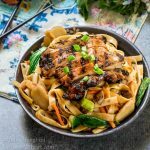 I’m glad you shared this delicious looking and easy to prepare recipe with us. That is so true Karen. I can make them old recipes and they are just as good today. 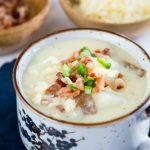 This looks so delicious and the ultimate comfort food! Thank you, Jennifer! We did our best to polish it off all by ourselves. This looks like the perfect apple pie! I want a slice! Thank you, Madi! So easy too! My sisters are coming for a “Fall” weekend visit – wine and pizza party at my favorite Italian store/restaurant and a cider mill. One of them requested my apple pie – wish I could surprise them and make your crustless pie but that would not go over too good. That sounds like a lot of fun Judi! I totally understand that those sisters can have their expectations. Enjoy your wine and pizza. That’s a winner in my book. I love a good crust, but this looks so good I know I wont even miss it. 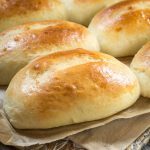 The fact that its a family recipe makes it even more special– those always are the best recipes! Thank you, Michelle! It’s so easy that it should maybe called an apple cheat pie. Homemade pie is the best and I’m not a big fan of the crust, so this is perfect for me! Thank you! This as such an easy pie to put together too! The crispy texture of the crust on top looks so delicious! I’ve never heard of this pie before but I can’t wait to try! Thank you! I’ve never seen it anywhere else and it was a favorite of ours growing up. I haven’t made a pie in forever. This sounds delicious and I know we’d all love it! Thank you Debra! So easy too! This looks good! Perfect for fall. Now I just have to decide if I want to serve it with vanilla ice cream or cheddar cheese. Thank you! Ice cream is definitely my vote! I haven’t tried Swedish Apple Pie before. This is going to be so much fun to bake and eat. Looks so delicious. Thank you Rini! It’s so easy to put together and yummy to eat. Me too! Than you Nancy! Thank you Mollie! I hope you like it as much as we do! Just the other day I was thinking of this Julie – an apple pie that has no crust, but I couldn’t for the life of me come up with anything…. I wonder how it would taste if I substituted almond meal? Definitely one I will be trying with the apple season in full swing. I hope you are doing well sweet friend. Hi there Loretta! I’d love for you to fill me in on how the almond meal works. It sounds delicious! I am definitely feeling the apple season and even though I eat them all year round they taste so good now. Thank you for stopping by with the shout out my lovely friend!